Many researchers have turned to surface plasmon resonance (SPR) for binding studies because it is a highly sensitive technique that produces high resolution binding kinetics compared to other binding analysis tools. Researchers who are working on SPR binding studies often work with challenging samples. A very common example is small molecule or protein binding, where sensitivity is very important due to the small size of the analyte. Nicoya’s new High-Sensitivity Sensors have been engineered to enable up to a 4x increase in ligand immobilization levels while maintaining the same ligand density on the sensor surface. This advanced sensor design helps increase resolution of interactions between high molecular weight ligands and low molecular weight analytes, improving data quality. 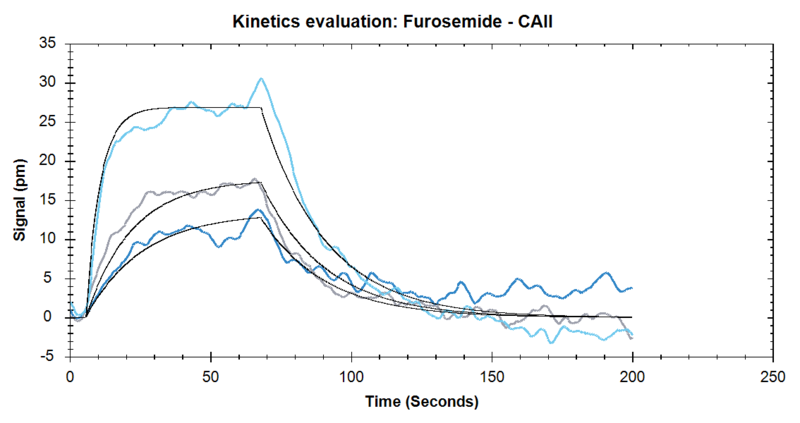 Nicoya’s High Sensitivity Sensors improve kinetic analysis of biomolecular interactions by increasing both the ligand immobilization and analyte detection signal. As Figures 1 and 2 show, the High Sensitivity Sensors produce up to 4x higher sensitivity compared to Standard Sensors while using the same concentrations of analyte and ligand. Take a look at our application note to see how High Sensitivity sensors provide researchers with more flexibility while working with proteins and/or small molecule samples. Figure 1. 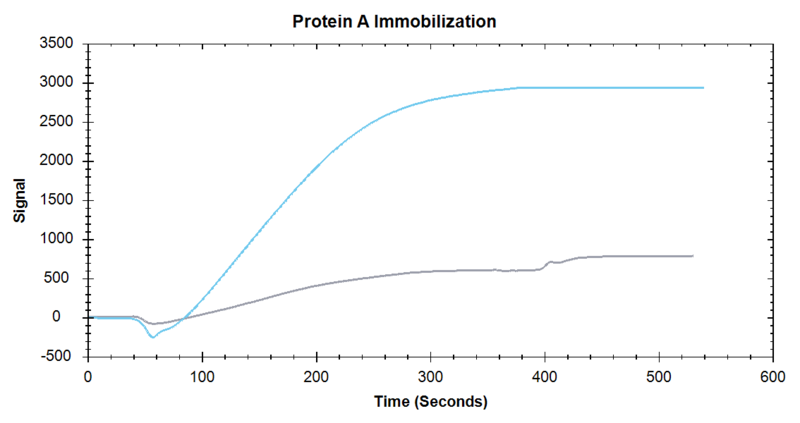 Immobilization of Protein A onto a High Sensitivity Carboxyl Sensor (blue) and Standard Carboxyl Sensor (grey). Figure 2. 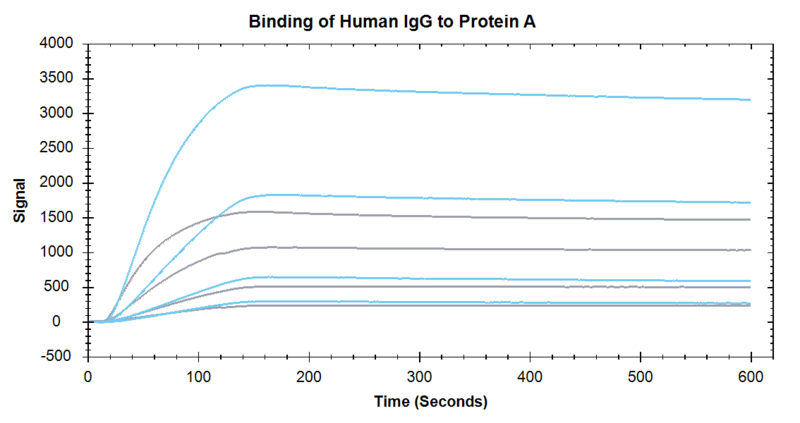 Binding of Human IgG at concentrations of 4.1 nM, 12.3 nM, 37 nM and 111nM. Blue lines are measured on a High Sensitivity Sensor and grey lines are measured on a Standard Sensor. Why do we use Surface Plasmon Resonance? Surface plasmon resonance (SPR) can be used to analyze all types of interactions ranging from protein-protein, protein-nucleic acid, antibody-antigen and many more. One major area of study with SPR is protein-small molecule interactions because it provides researchers quantitative insight into how their candidate therapeutics interact with their intended protein targets, but this type of biomolecular interaction analysis can be difficult to resolve with many techniques. There are many techniques available for obtaining accurate, quantitative and reproducible binding data including BLI, ITC, or MST. These techniques will provide quantitative binding data but come with a number of drawbacks including lower reproducibility, high sample consumption, labelling requirements and notably, large costs. Scientists have turned to SPR to define the kinetic constants of these types of interactions because of the high sensitivity, high resolution and high reproducibility of SPR. Nicoya’s High Sensitivity Sensors improve data quality in small molecule binding interactions by increasing ligand immobilization and enhancing analyte signal detection levels. As Figures 3 and 4 show, the High Sensitivity sensors produce a high ligand immobilization signal which subsequently improves small molecule analyte detection. Take a look at our application note to see how High Sensitivity sensors provide researchers with more flexibility while working with proteins and/or small molecule samples. Figure 4. Binding of Furosemide at concentrations of 333nM, 1μM, and 9μM. Solid black lines are the one to one binding model fits. When running SPR kinetics experiments, it is important to maximize detection with the lowest ligand density possible. A common strategy when working with smaller molecular weight analytes is to flood the sensor surface with immobilized ligand to observe the highest possible signal. But overcrowding the sensor surface can have negative effects on data quality due to mass transfer effects, steric hindrance or re-binding. The new High Sensitivity Sensors provide researchers with a solution to overcrowding without sacrificing on data quality. Notably, these new sensors were designed for researchers with tough applications, such as protein-small molecule binding, but they can also be employed in applications such as protein-protein or protein-nucleic acid interactions to help reduce the effects of mass transfer, steric hindrance or re-binding. Our High Sensitivity Sensors are available in carboxyl, NTA and streptavidin surface chemistries to see which surface chemistry is right for your applications, take a look at our comprehensive sensor chip guide. How can you get OpenSPR in your lab? OpenSPR has helped hundreds of scientists accelerate their research and make their next big discovery. With Nicoya’s new High Sensitivity Sensors, scientists can now get even higher resolution binding kinetics data for tough applications in the same affordable, benchtop instrument. Whether you’re publishing in the world’s top scientific journal, writing a million dollar grant or getting your novel therapeutic to market, Nicoya’s High Sensitivity Sensors will help you get there faster. Nicoya strongly believes in creating an easily accessible experience for all current and future OpenSPR users. Book a remote web demonstration today to discuss your research applications by running through an OpenSPR experiment from start to finish with one of our application scientists.